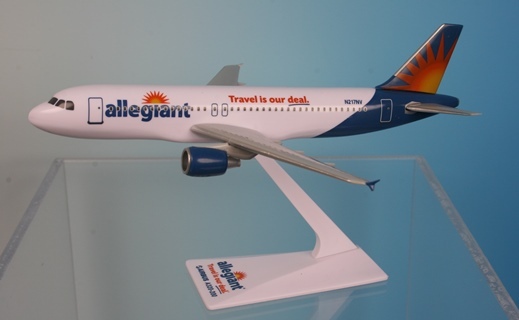 Flight Miniatures 1:200 Scale Plastic Snap-Fit - Airbus A320-200 - Length: 7.375" Wingspan: 6.75"
Allegiant's Airbus A320 and A319 aircraft received operation certificates in 2013. The aircraft family consists of short to medium range, single-aisle jet airliners. From America's favorite small cities to world-class destinations, Allegiant makes leisure travel affordable and convenient. With low-low fares, nonstop, all-jet service and premier travel partners, Allegiant provides a complete travel experience with great value and without all the hassle. Allegiant Air was founded in 1997 and is certificated by the U.S. Department of Transportation (DOT) as a "Scheduled Air Carrier" with authority to fly scheduled and charter airline operations throughout the U.S. The Company also has authority for charter service to Canada and Mexico.